Fluxus the condition is what the house is going to be in real soon when the grandkids arrive this evening. So Fluxus the beer is going to get in my belly pretty quickly and then it will be on to pizza and Christmas charades. We’re back in the U.S.A. with this one, with the always intriguing and usually expert Allagash of Portland, Maine. Well, always expert as far as I’m concerned. I can’t recall an Allagash beer I haven’t liked. Although there are plenty I haven’t had because their more resplendent special brews—which no doubt are difficult to make—are just too damn expensive for my budget. It’s a pity, as this beer readily shows, because it’s quite a treat, though a $19 one for a 750ml bottle. That’s getting up there, though there is an added benefit to buying the beer—a portion of the proceeds will go to Window Dressers, a non-profit helping underprivileged Mainers (who certainly won’t be buying it) stay warm. The organization helps conserve fuel and reduce heating costs by minimizing heat loss through the use of window inserts. I avoided heat loss, temporarily anyway, by inserting the beer into my digestive tract. It’s most likely a one-time affair; when the brew rolls around again as a 2017 beer it will surely be a different recipe. 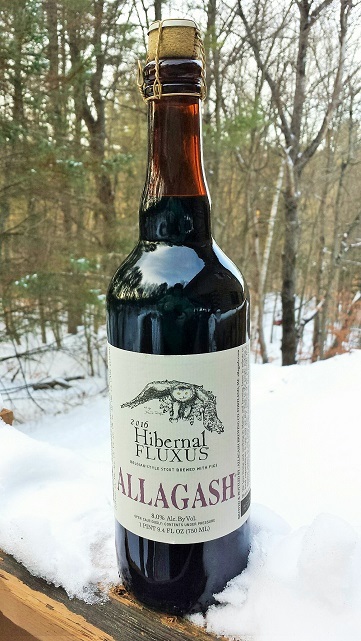 Allagash has released a different Fluxus beer every summer since 2007, but this is the first year they’ve decided to add a winter companion. 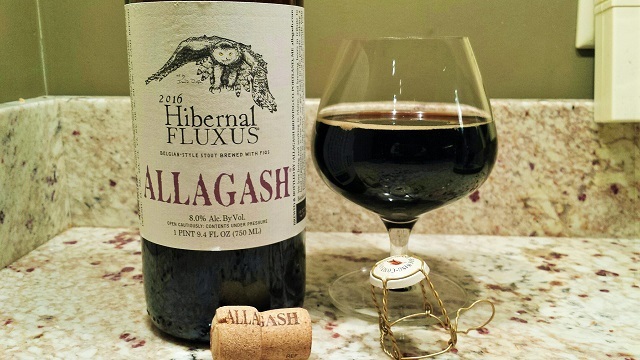 The first Hibernal Fluxus is a Belgian-style stout brewed with figs. But for starters, a kitchen sink of grains goes into the kettle—Marris Otter, roasted barley, Midnight Wheat, Special B, chocolate malt and oats. A lot of potential sweetness there, but leveled out with Northern Brewer and Hallertau hops. 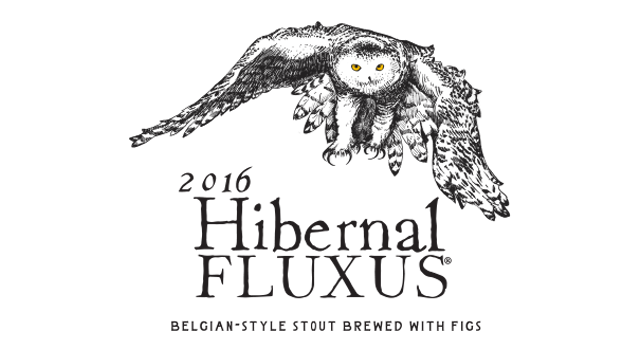 (All this is on the helpfully descriptive label, which also has a striking drawing of an owl by Portland artist David Wolfe.) And then there are the figs, added right in the mash and later steeped in the whirlpool. The beer pours an opaque brown with a dark tan, espresso-like head. The figs suggest themselves, but probably only because I knew they were there. But so is a lot of chocolate, a hint of anise, an ample roast. All of which carries over into the flavor. It’s a big, chewy mouthful that goes down all too smoothly, with little hint of alcohol burn. I finished the beer up after the gang arrived. I was sitting contently by the woodstove, but that wasn’t the only thing warming me up. Availability: Limited. Allagash is distributed in 17 mostly eastern states and California, and Washington D.C.